Munich. 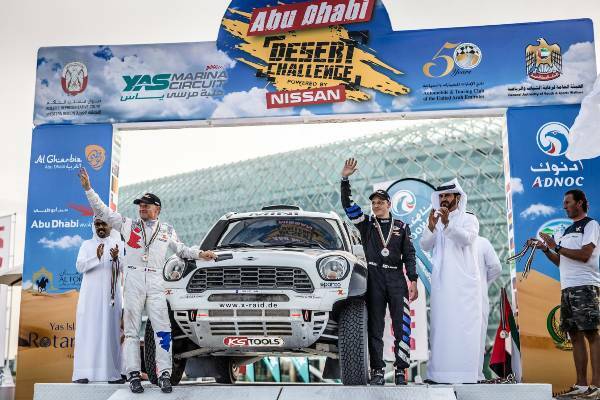 The MINI ALL4 Racing crew of Yazeed Al Rajhi (KSA) and co-driver Timo Gottschalk (GER) completed the Abu Dhabi Desert Challenge, round two of the 2016 FIA Cross Country World Cup, with a hard-earned second place. Joining them on the rostrum in third place was the fellow MINI ALL4 Racing crew of Mikko Hirvonen (FIN) and Michel Perin (FRA). Further success for MINI came with four MINI ALL4 Racing completing the race within the top five, and a total of five of these iconic long-distance cross-country rally cars completed within the top ten. Mikko Hirvonen (FIN) once again showed why he and co-driver Michel Perin (FRA) are a force to be reckoned with. Although this event was Hirvonen’s longest desert race to date, he took a stage win (St 4) and finished third place overall. For American Bryce Menzies, the Abu Dhabi Desert Challenge was his first race at the controls of a MINI ALL4 Racing – and the first race he has had to contend with five days continuous racing in desert conditions. For these reasons alone it is little wonder he and co-driver Andreas Schulz (GER) were celebrating their fourth place at the end of this challengine race. Jakub Przygonski (POL) with Tom Colsoul (BEL) in MINI ALL4 Racing #209 continued his learning curve of racing on four-wheels. The former motorcycle rally rider placed his MINI ALL4 racing in fifth place at the end of the five day race. United Arab Emirates driver Sh. Khalid Al Qassimi and co-driver Khalid Al Kendi (Abu Dhabi Racing #203) were the fifth MINI ALL4 Racing crew to complete inside the top ten with a determined seventh place. German duo Stephan Schott and Holm Schmidt staged a magnificent recovery after slipping back in the race order on day three of the Abu Dhabi Desert Challenge. At the end of the final stage (St 5) they finished in 11th to secure 18th overall. The Russian pair of Vladimir Vasilyev/Konstantin Zhiltsov (#201) became front runners amongst the MINI ALL4 Racing during the early stages of the rally. Unfortunately an incident mid-point of the race led to retirement.